When Jessica first heard about the York Rescue Mission giving out Thanksgiving Food Boxes she didn’t think any more about it. After all she did have a job, in fact she had two. Others were more in need. But money was tight. As a single mother of a six year old boy there were always bills to pay. The heating bills kept rising and a growing boy keeps eating and growing. Jessica’s mother had lived with her until a year before she died which was in November 2012. Her mother had taught Jessica the love of God and the importance of staying in His will. Jessica had a real desire to help others even on her limited income and decided to take in a foster child. She wanted to give a child, who was going through a difficult time, a home. Once again there were three mouths to feed. She was eligible to receive financial support from foster care but did not receive any initial sustenance allowance. It was difficult for her to cover all her expenses. While there would be food on the table at Jessica’s home for the Thanksgiving meal, there wouldn’t be a lot or anything special. 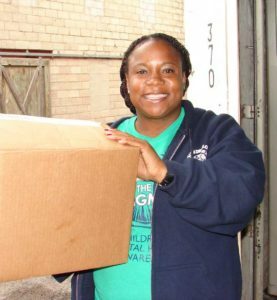 What a blessed surprise it was when Jessica opened the letter from the York Rescue Mission telling her when and where she could pick up her Thanksgiving Food Box! Jessica had forgotten that she had decided to sign up for a food box through an agency*. With the Thanksgiving Food Box, Jessica was not only able to provide a beautiful Thanksgiving meal for her son, her foster child and herself, she invited her best friend and her three children who were living in a hotel for the last three months after their house was flooded. They had nowhere to cook even if they had the food. Throughout the day, other friends stopped by, friends who were also living paycheck to paycheck. The box of food stretched further and further, feeding all who came through her doors. What a beautiful dinner! What a beautiful day! After using all the food, Jessica found an envelope in the box which asks the recipient to share with the Mission how the food helped. She was excited to let the donors know what a blessing the food was and how it helped so many. The blessing had come full circle, blessing Jessica and her family and she in turn was able to bless others in need. How humble she felt to be able to help others. And this year, even though the budget is still tight, Jessica wants to help others. So Jessica has decided that during the York Rescue Mission’s annual food drive, she will organize a food drive with her co-workers at the York Development Center to collect food to fill this year’s Thanksgiving Food Boxes as well as feed those individuals who come to the Mission daily for a meal.